Five years ago, Jen Doak saw opportunity in the form of a Gibson guitar. While Gibson inspired many a prolific musician over the years, Jen's epiphany was a little less "You Can't Always Get What You Want" and a little more (find a good song title here). Looking to build publicity for the Gibson Guitar showroom, Jen decided to bring together that most storied of pairings: musicians and alcohol. The creativity that allows musicians to blend notes, melodies and harmonies to produce a song inspired some of them to blend grapes and produce some of the area's best wine. (Even Dave Mathews has jumped on the trend lately, perhaps inspired by the venue he sells out every summer.) 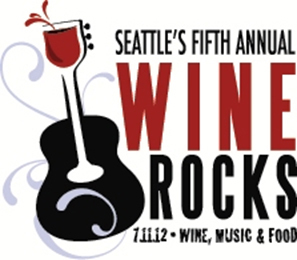 With winemakers taking the stage, the first Wine Rocks was born, and it's been going strong - and growing - ever since. From its beginnings in a Gibson showroom to this year’s Pier 66 venue, the Wine Rocks event has certainly grown up a bit, but it still possesses all the youthful spirit and rebellion one might expect in a city known for bucking and setting the musical trend. While wine tasting and music have long paired, it’s the unique opportunity to watch the hand that carefully crafted your Cabernet craft a squealing guitar solo instead that makes this event sell out every year. From up and coming winemakers like Vinyl Wines’ Chip McLaughlin to familiar faces like Chatter Creek’s Gordy Rawson, a number of Washington’s winemakers will be hoping you dig their jams as much as you dig their juice. Partying like a rock star means eating like a rock star, and in the Pacific NW that means one thing: Food Trucks. Last year’s Georgetown event introduced the trendy bites, and this year’s lineup features some of the best eateries on 4-6 wheels. One swing through Portland, Austin, or any other hipster food capitol and you’ll see that the battle for food truck supremacy is fierce. So how can you pass up the opportunity to dine from the truck ranked America’s Best? Marination Mobile will be there slinging tacos, sliders, and (fingers crossed) their mouth-watering Kimchi Rice Bowl. Save room for the bite-size Filipino delicacies from Lumpia World, check out an Eastern take on the ballgame classic at Tokyo Dog, and of course, save room for dessert from Sweet Wheels. While the wine at this event rocks in more ways than one, sometimes a summer night calls for an ice cold beer or a cocktail. Our friends at Pike Place Brewery and Pyramid Brewery will ensure you get your hop fix if you need to throw a challenge at your palate. Girl power will be in full force with female-run Brovo Spirits, and the local emphasis continues with Washington-based Project V Distillery. The main event, of course, is the wine, and this event gives you lots of wineries and price points to choose from. July 5 is the official start of Seattle summer (in case you missed the memo about Juneuary), and this event is perfect to find the Rosé, crisp white, or smooth red you'll be sipping all summer. There will be some familiar names for readers of the Anthem, like Dusted Valley, Fidelitas, Kiona, Long Shadows and Smasne. Hitting up the White House-approved bubbles from Treveri Cellars may be the closest most of us come to the Oval Office. With 40 wineries to choose from, you're sure to find a new favorite.